​Our pups and adult bulldogs are well taken care of on our 8 acre lot, and from their first moments next to their mothers to their relaxing golden years, they are sure to enjoy their time here! We love each one of our dogs and we know that you will too! BullDan Kennels is currently working with other kennels to continue breeding a variety of Johnson and Bully type dogs. All dogs are registered with the ARF, NKC, and the English Bulldogs AKC. BullDan Kennels is a private American and English bulldog breeder in Northeast Georgia, specializing in raising fun, loving, healthy bulldog pups. We are dedicated to owning and breeding American and English bulldogs that display the best attributes of the breed and continue to complete hearts and homes. Our pups come from specially selected, award-winning parents to ensure beautiful markings, shining coats, and strong physiques. We work with our dogs daily to help cultivate good temperaments and sociability. Puppies are exposed to other dogs and different people to help them adjust to diverse environments and promote fun, playful personalities. The Bulldog’s steadfast loyalty, easy-going character, and adoring nature all shine in our puppies and adults. 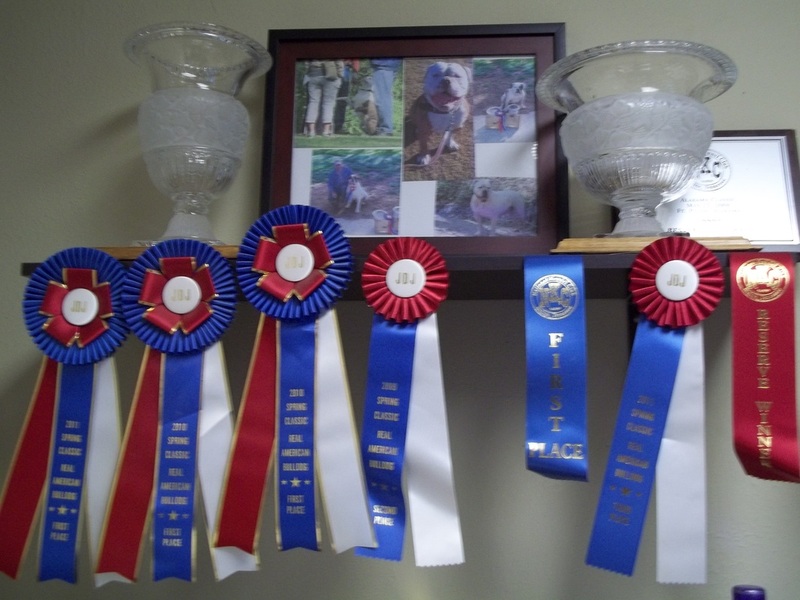 To find your champion show dog or a loyal addition to your family, see our heart-stealing puppy pictures and videos on our available pups! ​The Bulldog, to the best of our knowledge, had its origin in the British Isles. The name "bull" was applied because of the dog's use in the sport of bull baiting, which was extremely cruel. The original Bulldog had to be very ferocious, savage, and courageous as to be almost insensitive to pain. In 1835, dog fighting as a sport became illegal in England. Therefore, the English Bulldog had outlived their usefulness with numbered days. However, there were dog lovers who felt deep disappointment at the passing of the breed, and set themselves the task of preserving it. They proceeded to eliminate the undesirable fierce characteristics, to preserve and accentuate their finer qualities. Within a few generations, the English Bulldog became one of the finest physical breeds, minus its original viciousness. We may be justly proud of the Bulldog we know today, and we must express our gratitude to our British cousins, who realized the value of the English Bull sufficiently to preserve him for posterity! In colonial America, bulldogs were used by butchers and even engaged in baiting contests with bulls, bears and buffaloes. The modern American Bulldog can trace it's roots to remnants of the original Bulldog that managed to survive as farmers' catch-dogs in isolated pockets of the Southeastern United States. Their original purpose on these Southern plantations and ranches was personal and property protection and as an aid in handling large animals such as cattle and hogs. All modern American Bulldogs can trace their roots to four strains from the Alabama and Georgia area. The American Bulldog became noticed by the public in the late 1980's and began to increase in popularity. A good all-around family pet and guard dog was a thing to be desired. American Bulldogs are powerful, strong willed dogs, but with basic obedience training and early socialization they make good canine citizens!